Just a few months ago, in November 2016, the world celebrated the coming-into-effect of the 2015 Paris Agreement on limiting anthropogenic global warming – only to get disappointed shortly after by the announcement of the POTUS-elect that he intended to cancel the treaty. The leader of one of the planet's most polluting nations who is at the same time commander-in-chief of the US army, the single biggest polluter worldwide, has already started to dismantle mechanisms of environmental protection both at home and abroad. One could sing a very sad song about that, but I want to talk about something else here. As we will see by the end of this essay, the United States' adherence or non-adherence to the Paris Agreement might be of marginal significance to the unfolding of climate change, if at all. The Paris Agreement which has been signed by numerous nations on the 21st UN Climate Change Conference (COP 21) has actually been a breakthrough, somehow, because, for the first time, a majority of the world's countries, including the US, have committed to far-reaching specific goals for environmental protection, in order to prevent catastrophic climate change. But that victory's value is only of symbolic nature; it will not achieve what it is supposedly meant to do. Quite the opposite. Various scientists have pointed out that the treaty is simply misleading public opinion. The action to be taken will not only be insufficient, it is coming too late – by decades – and will result in inappropriate handling of this truly existential crisis of our planet. Therefore it is suitable for leading to great damage. The Paris Agreement is mainly based on data collected, reviewed, evaluated, and presented by the Inter-governmental Panel on Climate Change (IPCC). Its main goals – curbing global warming at 2°C above pre-industrial levels, ideally stopping it at 1.5°C, through national carbon budgets – derive from reports issued by the IPCC. Certainly it'd be unfair to demand infallability of those good folks, but criticism of the IPCC has been getting louder and louder over the years, and point is adding to serious point. Those who believe that the tide is turning, climate-wise, should definitely have a look at what the general public is being served as a major breakthrough. Let's dive into matters from here on. As its name suggests, the IPCC consists of government representatives of the world's nations. Founded in 1988, its purpose has been to inform decision makers of the state of global climate. The IPCC appoints scientists which are to provide assessment reports. The last word on content and way of publication are with the IPCC, i.e. the governments, not with the scientists. The latest report has been issued in 2013 (AR5). It is the scientist's duty to come to an assessment of the future development of the global climate system. Their appraisal has to be based on solid data. Well, we all heard about climate change denial, and we would like to have a clear picture of what is going on, rather than having to rely on anybody's best guesses. There is just one problem with solid data: it is old data. For scientific research to receive wider acknowledgement, the reports have to go through a lengthy process of checks and appraisals by fellow scientists, the so-called peer review. This usually takes two to three years before relevant journals are willing to print the report. Only then does the scientific community regard the data as solid. The assessment by the IPCC takes several years more, e.g. it is currently in its sixth cycle of assessment, the report of which is not to be expected before 2022. So the data grows old and older. Climate, in the meantime, continues to change, and quickly. The current state of affairs is documented 'merely' through unreviewed measurements. Instead of working with those, the IPCC used computer models. There is much to criticise about that. Models can provide only rough calculations of climatic mechanisms. Small causes below the resolution of the model can amplify into surprisingly huge effects. One example of this is the localised melt of the Greenland ice sheet through darker particles and its large-scale destabilisation through the resulting melt water. Quite a few fundamental climate factors have been missing from the IPCC's models, such as the greenhouse gases methane and water vapor, and the multiple effects of melting polar icecaps. Those factors are not merely adding up, they interact with each other. That means, instead of the expected (by IPCC) relatively steady increase we see a sudden escalation in figures, such as with global average temperatures and polar ice melt. Already more than seventy natural feedback processes have been identified which reinforce themselves and each other and drive the heating of the atmosphere without needing further human intervention. The IPCC does not acknowledge any of these feedback loops. That's why the IPCC has come to false predictions regarding polar ice melting, atmospheric temperature development and greenhouse gas concentrations, all of which are skyrocketing at unprecedented speed. No wonder – the models were completely inaccurate, as illustrated by the following chart. 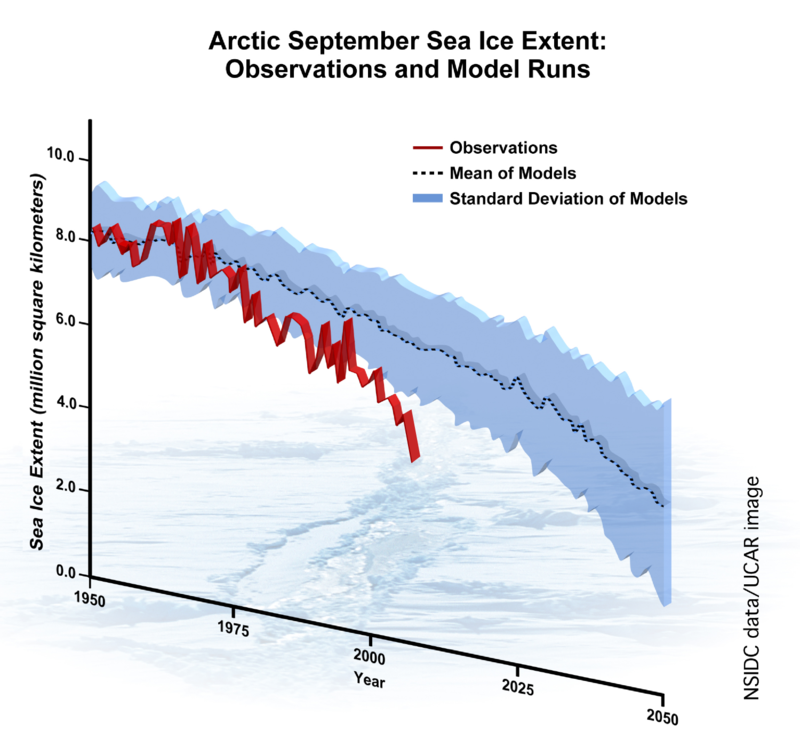 measured data (red) as compared to modeled Arctic sea ice extent (blue). It is easy to see how inaccurate models prevent people from getting aware of the obvious emergency. Instead of an ice-free Arctic starting from somewhen between 2017 and 2025, IPCC predicts this so-called Blue-Ocean Event from 2100 on, when today's decision makers will no longer be alive. Blue Ocean leads to significantly higher intake of solar radiation energy, resulting in higher water temperatures, and those will probably trigger massive outbursts of methane from the seabed; a sudden leap in atmospheric temperatures will be the consequence – exactly how the 'Great Dying' some 250 Million years ago came about, when more than 90% of all life forms went extinct. Scientists tend to give conservative figures. That's not new. Valuing the models with their systematic large-scale deviation higher than the real figures is. The intervention of governments in the interest of fossil fuel industries has played a major role in this, some scientists reported. Further window-dressing has been achieved by shifting the baseline. In the 80s, the UN held that a 1°C temperature rise above a pre-industrial baseline (1750) was beyond safe. Today, the IPCC is talking about 2°C as compared to a pre-industrial baseline, meaning 1880 (!) In those intermitting 120 years, global average temperature has risen by at least 0.3°C due to human activity. Recently we see more and more publications that use an even later baseline, thus playing down the level of warming the planet has already reached. Ordinary people watching the news usually won't become aware of it; they will falsely believe that there is plenty of time for countermeasures while there isn't. David Wasdell, director of the Apollo-Gaia Project, previously coordinator of the Meridian Programme, comes to similar results. Years of climate research enabled him to draw a corrected version of the IPCC's chart depicting the relation between industrial CO2 emissions, CO2 concentrations in the atmosphere, and expected global atmospheric temperature rise. The top of the graph translates the weights of carbon into their equivalent amounts of CO2, in parts per million (ppm). This translates into a total amount of human carbon emissions measured in petagrams (PgC), shown on the lower edge. The vertical axis shows the temperature increase which a certain amount of greenhouse gases may result in. This depends on the models used. The blue line shows the steady increase the IPCC models project. This does not acknowledge greenhouse gases other than CO2, and it does not account for changes related to the melting of the polar ice caps. It doesn't acknowledge the dynamics of natural processes. The curved red line calculated by Wasdell does include some of these factors and is matching paleoclimatic precedence. The temperature response to the 2014 set of emission-reduction pledges is about 10°C, not 4°C . This is where we are most likely headed as many states seem to have a hard time implementing the Paris Agreement. 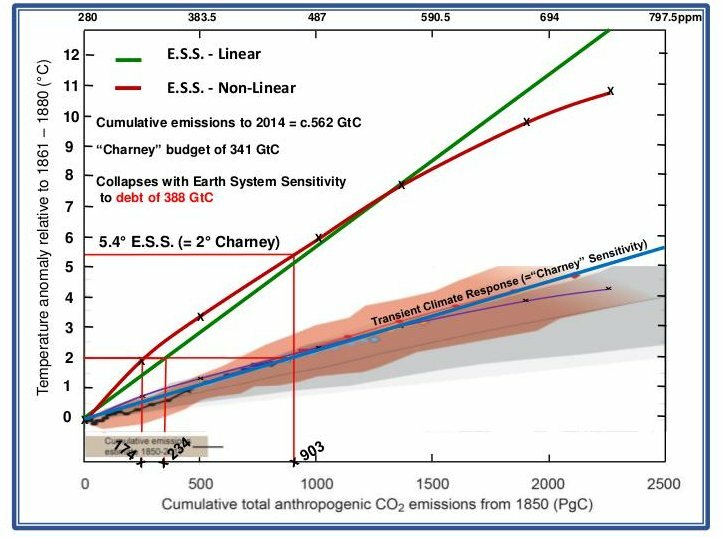 If we actually performed as proposed by the AR5/Paris Agreement, we'd end up at 5.4°C, not 2°C. The atmospheric CO2 concentration in 2014 already leads us to 3.9°C, not 1.5°C. The effect of other greenhouse gases which have been disregarded by IPCC needs to be added. The temperature increase locked in actually amounts to min. 6°C and will probably lead to a sea level rise of 23 meters, following precedents in Earth's history, according to Guy McPherson. We don't need to worry about wet feet, though, because a temperature rise by 3.9°C equals the extinction of the human race, following the demise of our crop plants. The so-called CO2 budget of 300 gigatons which could supposedly get emitted before breaking the 2°C limit is wholly illusory. In reality the account was already overdrawn by 388 gigatons, with 10 gigatons of industrial carbon pollution being added every year. There is no budget to distribute. We have missed that exit decades ago, around 1970. Those who do not shy away from climate technical vocabulary should have a look at Wasdell's critical evaluation of the AR5. 2°C are not a goal based in science. The limit has been set by the neoliberal economist William Nordhaus who tried to define conditions under which economic activity makes sense. 2°C are not a safe goal. This shows clearly from the increasingly numerous, increasingly massive natural disasters over the last few decades. Epic droughts, larger storms, rainbombs, quickly changing weather, extreme heat and cold – and all of these clearly more often today than in the past. It already devastates crops throughout the world, from Spanish lettuce to Californian almonds, from Australian sugar to Indian grains. 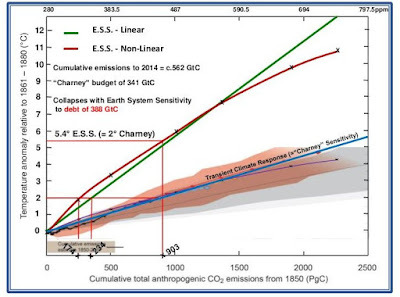 2°C are not a realistic goal, even by the assessment of the IPCC. AR5 states that it requires geo-engineering to achieve its 2°C goal (which is really 5.4°C), yet it fails to mention any specific technology that can accomplish this. Such a technology which could manipulate climatic factors in the short-term and on a global scale does not exist yet! The Paris Agreement of 2015 whose goals and policies mirror the fifth assessment report of 2013 of the IPCC exposes the community of life on Earth to dangerous climatic changes, says David Wasdell in his critical evaluation. Others – Sam Carana, Michael Mann, James Hansen, or Paul Beckwith – do call for immediate action. They propose a shift to renewable energy sources and demand geo-engineering of various kinds. In the absence of suitable geo-engineering technologies, and factoring in that the so-called renewables are not carbon-neutral at all, Professor Guy McPherson came to the conclusion that the train of civilization has jumped tracks and is heading for the bottom of the cliff. Global warming might not be catastrophic, but rather apocalyptic in extent, as human activity has triggered a sixth mass extinction already which may only get worse on this quickly heating planet. It's literally 2.5°C to Midnight. I would have liked to end this essay with the words, „If that is so, who cares what America is doing or not doing?“ Yet the one thing America still may – and possibly will – do is to throw the planet into a nuclear winter, either deliberately to stop the warming, or as a byproduct of their pursuit of securing the remaining resources it needs for feeding its war machine. You may think that all this is far out and that things could be worse than what you see outside your window. And that's true. Yes they can. Labels: climate disruption, collapse of civilization, corruption, english, politics & gov. In the second graph of temperature anomaly relative to carbon dioxide emissions to date, what if the red curve crossed the green line at a much higher temperature on account of the other greenhouse gasses being emitted? Your X axis doesn't stipulate CO2e (equiv) emissions. What about methane (CH4; 150x-86x more powerful), nitrous oxide (N2O; 300x more powerful), or water vapor (7% more per degree Celsius of GAT rise). That would mean a steeper beginning than displayed, and a much faster rise in GAT. Which we are seeing happening. To my understanding, methane is part of the carbon cycle sensitivity calculated into the graph. Water vapor and N2O are missing, though. Will correct the text accorcdingly. Thanks for the input, Karl! Regarding projected temperature rise, Wasdell himself says that his figures "should be treated as a conservative baseline. The actual response of the earth’s climate system is expected to be even higher." Admittedly, I have not criticized civilization as such in this essay, but I got a thing or two to say about it. If you have a look at some of the other articles you will find that I didn't really forget the mirrors/filters in space, nor any of the many other geo-engineering proposals, including biochar/permaculture 'solutions'. The fact that this culture is wrecking the planet with its idea that Earth is just a pile of stuff ready to get mined, used, controlled and manipulated by us humans as we please. We even exploit ourselves in the process, so I don't see how more of the same -- technology and control -- could possibly provide us with a habitable planet, let alone end all hunger and poverty. Even if we were to say, ok, let's tackle one issue after another -- do you see anyone who is willing to pick up the task? Tthe US government has been warned in 1965 already that action needed to be taken, explicitly also methods of reversing the damage done, yet nothing has happened, and politicians still evade to address climate change head on. Instead, downplay on the data front, climate accords on pointless goals, windowdressing in the mass media. Brilliant piece, thank you very much. Just the facts. That is good journalism my friend. Well written, well planned out. I really enjoyed it. You should send it to the guardian, without the bolding. They will publish it. And there are at least five thousand people in north america alone who are so convinced of near term human extinction, they have joined a facebook support group. Guy Mcpherson is an optimist to a lot of people. He is to me. Ofcourse they are going to use the nukes - why do you think everybody is engaged in regime change by revolution. Set off those bombs - they think it is going to work and are trying not to be the one who fires first. Thanks for your kind comment, Robert. Quite possible The Guardian would publish it, but then again, I am a writer troubled with a deep distrust for all institutions and all attempts to reach out to the masses. We defend what we love. We love what we relate to. We relate to what we know. We know what we experience. People who experience the destructiveness of our culture in their every cell are the only ones who are acting. It's for those folks -- those who already get it on a gut and heart level -- that I write my essays. The place of our deepest insights cannot be reached by words, only by experience, and this I cannot deliver. The Guardian has published quite a lot of alarming pieces already, two of them mentioned in the links section of my article. If its readers are not shaken up yet, into abandoning their masters and starting a different kind of life another piece of criticism won't do the magic either. Regarding the nukes, I tend to agree with you because I haven't seen much that stands against such a trajectory. My reservation here concerns us probably not knowing nearly enough to say anything with certainty. It's Charles Eisenstein's view that to judge the situation by facts and nunmbers helps us in no way anyway. From my experience, what he says about "Grief and Carbon Reductionism" sounds profoundly true. 2C to Midnight, like the rest of my blog, is licenced under Creative Commons by-nc-sa 3.0; anyone who likes to share, link, quote, or adapt it is free to do so -- just in case you'd really like to have the article being read by some larger audience. I am so glad that you are others here are researching and challenging the reporting of governments, which have a severe conflict of interest in being honest. Thank you, Jurgen. I'm now living closer to the earth than ever and will continue to simplify until my body cannot perform. I cannot remember a single instance in which a government said the truth without being forced to do so. For this reason alone the IPCC's report should be disregarded, and people need to take action into their own hands if they want a different direction in any matter they care about. It's great that people like you give their lives meaning by embodying the values they hold dear.